Say Thank You in a gourmet way when you send this crème de la crème thank you gift basket full of fresh, premium artisan cheeses that are handmade on small farms in the lush California wine country. 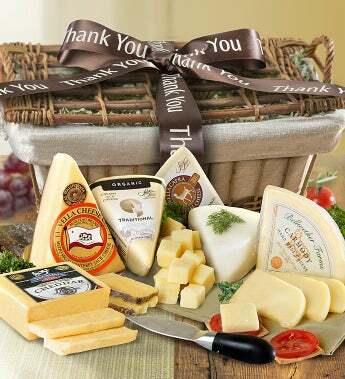 All natural palate-pleasers, these cheeses are the perfect Thank You gift for the true cheese lover. They’ll arrive in a sophisticated, twill lined willow thank you gift basket, tied with an elegant white bow and will delight bite after delicious bite. Say Thank You in a gourmet way when you send this crème de la crème thank you gift basket full of fresh, premium artisan cheeses that are handmade on small farms in the lush California wine country.